Power Vac Corporation introduces the world's largest and most powerful swimming pool vacuum ever. Designed especially for waterparks and large resort-style pools. This new vacuum measures 40 inches aross with an 8-inch throat. It vacuums large piles of leaves, coins, even fine dirt, cutting your cleaning time in half. The Sky Runner is just one of the new Xtreme Play products GameTime premiered in Seattle, and kids are finding it as enticing as you did. Available with a tilted or straight upright, the Sky Runner provides a thrilling ride for several children at the same time. The tilted upright version provides an up-and-down motion as kids circle; the straight version keeps them on an even course. The mini Sky Runner is also available with a straight upright to accommodate smaller groups of children. 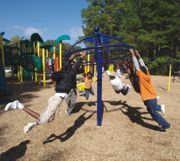 Sky Runners teach cooperative play behaviors as kids work together to make it go. Life Fitness' new Summit Trainer combines the best of total-body cross-training and climbing into one intuitive product that can challenge any user. This innovative cardiovascular machine targets multiple muscle groups and enables users to select a variety of positions for achieving different training intensities. The Crazy Bones Bridge was designed to push children to use a variety of different muscles and skill sets. The Crazy Bones Bridge has a built-in climber to encourage strength and coordination during play. Textured treads enable superior traction for the ultimate trek. And while children are climbing through the bridge above, others can swing from the handrails structured into the bridge's skeleton below. Available in a range of colors and styles, the Crazy Bones Bridge was created with oval cutouts in the side panels to allow for easy child supervision. The bridge can also be customized with binoculars. Whether you want to add a little pizzazz or are looking for a way to keep traffic moving smoothly on your waterslides, Directional Systems has just what you're looking for. Rider Dispatch Systems and Rapid Racer Systems can really add extra entertainment to any pre-existing slide system. The Rider Dispatch System can help maintain a steady flow of riders and help reduce wait time for patrons. The Rapid Racer Systems allow riders to compete and see who can come in first place. Each system can be customized to fit the theme of any waterpark. Keystone Ridge Designs introduces an innovative breakthrough in metal furniture powder-coating technology with the Rosedale—an aluminum bench powder-coated to mimic the look of wood grain. By fusing high-definition photographic wood images on aluminum, the Rosedale offers an alternative to traditional wood benches without the characteristic splitting, warping or fading. This new process extends creative options while upholding the standards of quality, durability and craftsmanship. Since nine out of 10 high school and college volleyball programs are women's teams, Bison designed the new Lady CarbonMax system specifically for setup at women's height only. Composite carbon fiber standards are lightweight, yet equal the rigidity of steel posts that weigh as much as 60 pounds. Lady CarbonMax makes setup both fast and easy. Lady CarbonMax fits all 3-inch sockets, with free adapters for 3 1/2- or 4-inch sockets. Complete system includes standards, winch, Kevlar top rope net, net storage bag, antennae, net rope covers and floor sockets. Safety padding and padding lettering allow you to customize the court. Lyon Workspace Products recently added four new models to its line of all-welded storage cabinets with removable plastic bins. All models are 21 inches deep and 82 inches high. A 48-inch-wide model features 170 small plastic bins, plus 45 large bins. A companion 60-inch-wide model holds 170 small and 54 large bins. The other two cabinets, which are 36 inches wide each, incorporate bin and shelf storage into a single unit for greater flexibility. All models feature 14-gauge, all-welded construction with 4-inch-high legs welded on and shelves bolted in place. A three-point locking system with 3/8-inch lock rods delivers reliable, secure storage.